The real Gabby might have looked something like this cute parakeet. President Dwight D. Eisenhower kept a parakeet named Gabby at the White House for his handful of grandchildren. Not much is known about this pet bird, which joined the Eisenhower family in early 1954. We do know that Gabby, despite his name, wasn’t known to speak. 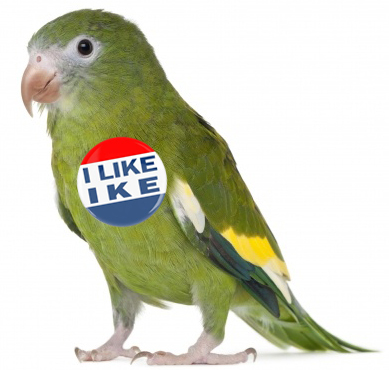 Apparently the parakeet wanted to let the president do all the talking. Gabby died in 1957 and was buried by the gardener at the southwest corner of the executive mansion. Back then, the grave was “marked with an asbestos shingle on which [was] stenciled the name Gabby,” according to news reports. Yes, the presidential bird’s burial made the news, albeit several months after the fact. 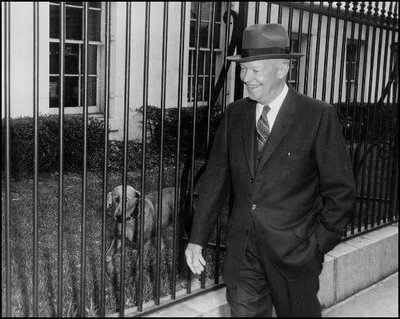 President Dwight D. Eisenhower walks by Heidi, his Weimaraner, as he returns to the White House after a press conference on March 11, 1959, at the Executive Office Building, which today is named the Eisenhower Executive Office Building in memory of the 34th president. Photo courtesy Dwight D. Eisenhower Library Center. Dwight Eisenhower’s dog, Heidi, has the dubious distinction of being possibly the only presidential dog banned from the White House. The story goes that Heidi, a beautiful female Weimaraner born May 9, 1955, had an accident on an expensive rug in the diplomatic reception room. Heidi’s weak bladder had gotten her into trouble before with the World War II general and his wife, so after the rug incident, the Eisenhowers decided to send the dog permanently to their farm in Gettysburg, Pennsylvania. 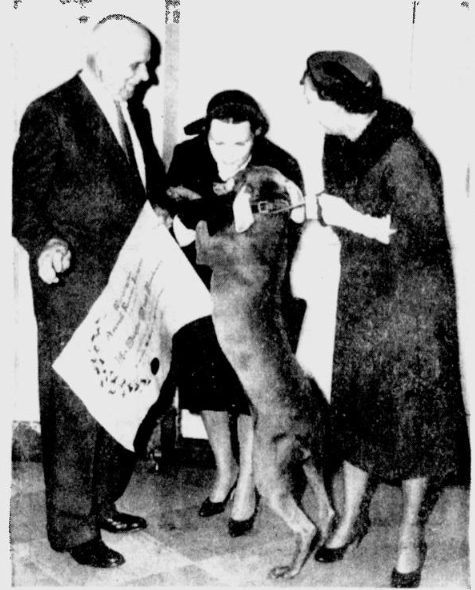 Mamie Eisenhower, right, tires to restrain Heidi as the dog jumps up on the director of the Tailwaggers Club of Washington, center. At left is Charles Hamilton of the Animal Rescue League. May 7, 1958, photo by AP wire service. True to her breed, Heidi was protective of her owners. She was especially wary of White House photographers and would often try to prevent Mamie Eisenhower from having her picture taken by jumping between the First Lady and the camera. Or Heidi would just jump up on people! 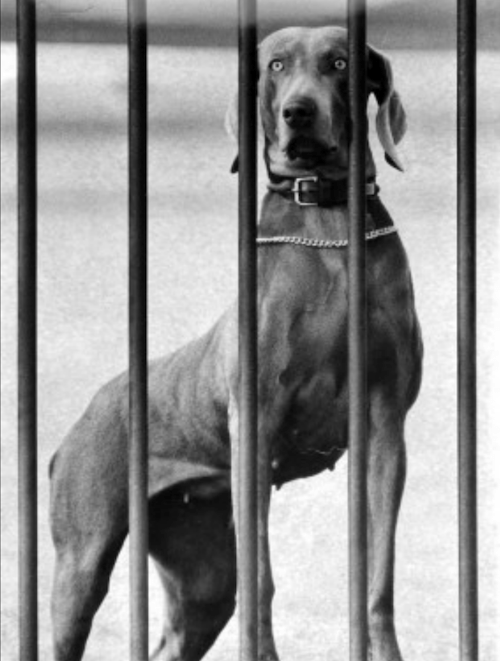 Although the breed has since become more recognized through the whimsical photographs of William Wegman, the Weimaraner was relatively unknown to Americans when Ike and Mamie moved to 1600 Pennsylvania Avenue in 1953. In fact, until the late 19th century, German breeders required that any Weimaraners sold for a trip to America be sterilized so that the breed standards would not be compromised. Heidi reportedly enjoyed life on the farm (where there were not as many photographers!) and had at least four puppies after she left Washington. For nearly a year, much of the press didn’t realize the president had the dog — even though Heidi had been “running all over” the White House lawn, according to Eisenhower’s press secretary. 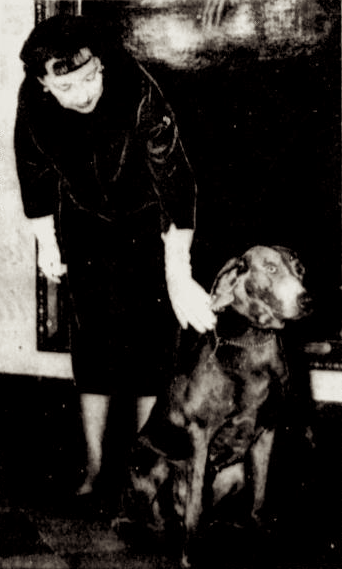 At first Mamie Eisenhower didn’t like the idea of having a dog. But the two were said to become great friends. On at least one occasion, Heidi had the presidential limo all to herself, with just the driver and a valet sitting up front during a drive from the White House to the Gettysburg farm. One day Heidi startled one of Eisenhower’s secretaries by pushing the buzzer underneath the president’s desk. The secretary came bounding in, notepad in hand, ready to follow orders. Back then, as today, reporters tended to go gaga over presidential pets. One newspaper claimed Heidi was fed a breakfast of two poached eggs on toast and two strips of bacon every day — which the White House laughed off and called “ridiculous.” However, one of her two meals a day was cooked ground beef mixed with dry dog food. Heidi slept in a comfy basket on the third floor, and had full run of the White House and grounds. During the day, she often napped in the president’s private office, where he gave her head scratches and belly rubs. For at least three years, Heidi still wore a tag that said “To President Eisenhower,” which came with the dog when she was gifted to the president by Bud Summerfield.